Preston Bailey has become especially renowned for his ability to completely transform raw, ordinary spaces into sumptuous, theatrical environments, translating his clients’ fantasies into awe-inspiring reality. Preston’s one-of-a-kind events, which included the most extravagant weddings and galas for Royal families across the globe, have earned him a reputation, as the world’s preeminent event designer. He has attracted such clients as Donald Trump, Oprah Winfrey, Uma Thurman, Joan Rivers, Donna Karen, Liza Minnelli, Matt Lauer, Catherine Zeta-Jones and Michael Douglas, Laurence Fishburne, Emmitt Smith and Bill Cosby. Preston’s signature style combines exuberant and harmonious color palettes, sensuous textures, shapes that are both architectural and organic, and modern adaptations of traditional elements to excite the senses in profound ways. Inspired by the simple beauty of the natural world, Preston is known for taking small, simple, elements, changing them, reshaping them and repeating them on many layers to create grand, spectacular dramatic statements. He loves to use flowers and his trademark floral decors speaks for themselves. “Bigger is better” and much more dramatic! He says he loves to leave the wedding guests breathless, and I think he definitely achieves it. In 2005, through a partnership with Sandals Resorts, the largest operator of luxury, all-inclusive resorts in the Caribbean, Preston designed four signature wedding collections, available exclusively to Sandals guests, which include beautifully deigned wedding settings and decor, bridal flowers, and elegant keepsakes. If you would like to view some of his work, pick up one of his best-sellers. 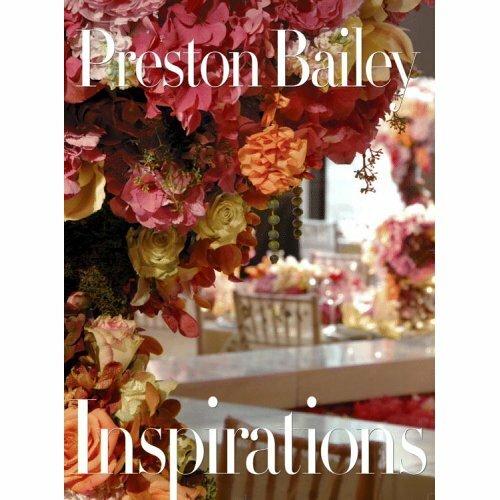 Preston has written three bestselling books, Design for Entertaining, Fantasy Weddings, and his latest, Inspirations. He is currently working on his fourth book, scheduled to be released in 2008. You can order his books on line at http://herweddingplanner.com/books/. Preston will be the keynote speaker at the 4th BizBash. TO Event Style Show, on February 20th. He will present new photos of his work, as well as discuss his inspirations and design process. For more information, please visit http://bizbashto.streampoint.biz/.